CARLSBAD, Calif., August 21, 2018 – NOTE: This June SPS profile was originally published in print in June 2018 and online in May 2018. Voelkers Auto Body & Glass is located in Newcastle, WY, a town with a population of fewer than 4,000 and well-known for oil, coal mining, and ranching, in addition to its incredible hiking trails and mesmerizing sunsets. In a small market where everybody knows one another, shop owner Ryan Voelker knows that he has to do a better job on each repair. That’s why he stresses customer service and uses the best tools he can find to achieve his goals. 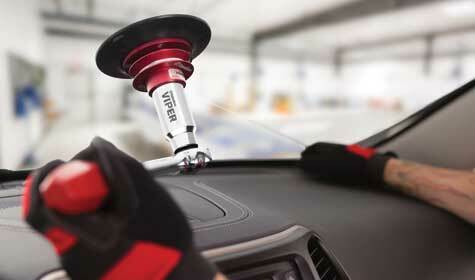 The Viper™ allows us to do our work without damaging the pinch welds or anything else, and it's really easy to use. When I get any tool or piece of equipment, I don't want to have to worry about whether or not it's doing the job, and with my Equalizer® glass tools, it's one less thing to worry about. To be a full-service shop, Voelkers Auto Body & Glass also has a mechanical shop and does car restorations. Offering a wide range of services that complement one another just makes sense when the next shop is located more than 80 miles away, Voelker said. For more than 15 years, Voelker has been using two particular glass tools made by Equalizer ®: the Viper™ and the Ambush™. He has been getting consistently excellent results across the board. Window replacement season in Voelker’s neck of the woods is springtime. That’s when his Equalizer® tools truly pay for themselves, he said. “The state of Wyoming uses sand instead of salt on the highways here, which leads to a lot of cracked windshields,” he said. “During the winter, people around here catch rocks from the road a lot, but then they normally wait until spring to get their windshields replaced. They don’t want us to replace their windshield until the weather gets better, because they might just pick up another stone the very next day. So that’s when we get a ton of window work all at the same time, but with the Equalizer® tools, we can handle it and get it done quickly. The Equalizer® Ambush™ is a reciprocating cutting tool designed to cut through the toughest urethane out there while getting into those tight and tricky areas where other cutters can’t. It comes with a heavy-duty 20-volt motor that provides the power to quickly remove the most difficult glass with the convenience of the battery and has a rubber over molded comfort grip and a quick release blade clamp. Global Education Director Gilbert Gutierrez at Equalizer® has seen more and more body shops adding glass services to their menu of services because it makes sense on many levels. Now 44 and having worked in the collision repair industry since 1999, Voelker likes what he’s doing, but also has an exit plan for when the time comes, he said.